Liverpool is one of the most famous football teams in the world and play in the English Premier League. Based at the iconic Anfield Stadium, Liverpool have won an impressive 18 League titles, seven FA Cups, five European Cups, three Uefa Cups, eight League Cups and 15 FA Community Shields. Known as the ‘Reds’, Liverpool are one of the most supported clubs in the world and have some of the most passionate fans, most of them based in the famous ‘Kop’ area of Anfield. Liverpool have had some of the best players ever to play the game feature amongst their ranks including Kenny Dalglish, Steven Gerrard, Ian Rush, Luis Suarez, Kevin Keegan, Peter Beardsley, Robbie Fowler and Michael Owen. Liverpool Football Club’s history begins in 1892 when the team was founded following a dispute between Everton’s committee and John Houlding, the club’s president and owner of the land at Anfield where they played. Following the dispute, Everton left to play at Goodison Park and Houlding founded Liverpool Football Club to play at Anfield. The newly founded Liverpool FC played their first game in 1892, winning their first league title in the 1900-091 season followed by a second one in 1906. 1914 saw them reach their first FA Cup Final although they lost 1-0 to Burnley. 1922 and 1923 saw them win consecutive First Division titles but fans would have to wait until the 1946-47 season until they would win another. Liverpool were relegated following the 1953-54 season and were still there in 1958 when Bill Shankly was appointed as manager. Immediately he released 24 players and worked with his close team of associates (including Joe Fagan and Bob Paisley) on getting back into the First Division. This happened in 1962 and so began a glorious period in Liverpool’s history. During this time under Shankly they won the First Division in 1964, the FA Cup in 1965 and the First Division again in 1966. They also made the final of the European Cup Winners Cup where they were brated by Borussia Dortmund. 1973 saw them win the League once again as well as the UEFA Cup and the FA Cup the following year. Soon after this he retired and was replaced by Bob Paisley. Bill Shankly’s years at the club were a golden period but the good times did not end with his retirement. His replacement, Bob Paisley who had been part of Shankly’s ‘Boot Room’ would go on to bring even more glory. Taking over in 1975, Paisley would spend nine seasons at the club and during this time the club would win 21 trophies. This would include six First Division titles, three European Cups, a UEFA Cup and three League Cups. The only trophy he didn’t lead Liverpool to win was the FA Cup. Liverpool would go on to more success in the 1980s under both Joe Fagan and Kenny Dalglish winning four more First Division titles, two FA Cups and the European Cup. However, the 80s will also be remembered as a turbulent time for Liverpool. Firstly thanks to the Heysel Stadium disaster in which the behaviour of Liverpool fans caused a retaining wall to collapse on Juventus fans,killing 39 people. This led to English clubs being banned from European competition for five years. The Hillsborough disaster in 1989 was the most tragic in Liverpool’s history. Playing Nottingham Forest in the FA Cup semi final at Hillsborough, 96 fans in total were killed after they were crushed against perimeter fencing. It was this tragedy that brought in all-seater stadiums in English top-flight football. Liverpool would go through a number of managers over the next few years but none would ever match up to the successes achieved by Bill Shankly and Bob Paisley. There were some high points though. Under Gerard Houllier, they won the FA Cup, League Cup and the UEFA Cup in 2001 and under Rael Rafael Benitez they won the the UEFA Champions League in a penalty shootout against AC Milan. Since this time Liverpool have remained a leading team in the Premier League (winning the FA Cup in 2005-06 and the League Cup in 2002-03 and 2011-12) but the Premiership title still eludes them. Following the sacking of Brendan Rodgers in 2015, Liverpool appointed Jurgen Klopp as manager and they were runners up in both the UEFA Europa League and the Football League Cup. Liverpool fans are hoping that the next few years will see the Premiership title and other trophies return to Anfield. Known for their iconic all red kit, Liverpool actually began life looking more like Everton, their kit until 1894 being blue and white quartered shirts. 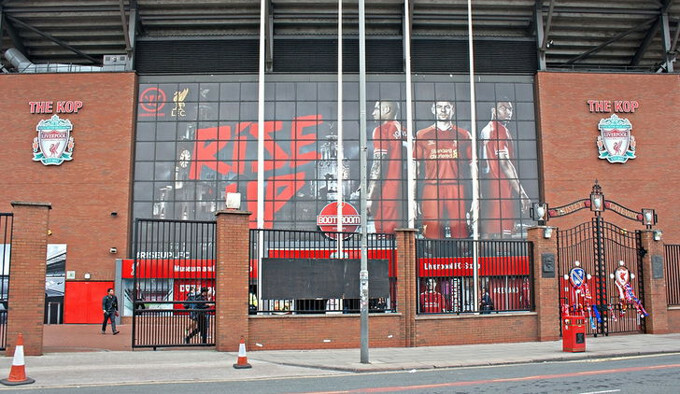 Anfield’s iconic ‘Kop’ part of the ground where the most fervent supporters are situated is named after the Spion Kop thanks to its steep nature. The Spion Kop is a steep hill in KwaZulu Natal and was the site of a battle during the second Boer War where over 300 men, many from Liverpool died. Anfield was originally home to Liverpool’s rivals Everton until a dispute with Anfield’s owner John Houlding led to him founding Liverpool Football Club.